BLOOMBERG -- "Rare-earth prices are set to extend their decline from records this year as buyers including Toyota Motor Corp. and General Electric Co. scale back using the materials in their cars and windmills. Prices for cerium and lanthanum, the most abundant rare- earth elements, will drop by 50 percent in 12 months, Christopher Ecclestone, an analyst at Hallgarten & Co. in New York, has forecast. Neodymium and praseodymium, metals used in permanent rare-earth magnets, may fall as much as 15 percent, he said. Makers of electric cars, wind turbines and oil-refining catalysts have sought to reduce use of the metals after China, which supplies more than 90 percent of the market, said in July 2010 that it would cut exports and clamp down on the industry. That boosted prices, encouraging mining companies to develop new prospects and buyers to find alternatives. 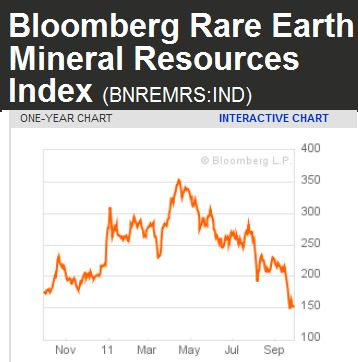 The Bloomberg Rare Earth Mineral Resources Index dropped 41 percent in the last three months (see chart above)." MP: This is a good example of how the price system transmits valuable information about the relative scarcity of natural resources, how market participants respond immediately and effectively to price changes that signal increased resource scarcity, and how those natural, automatic responses effectively solve the problem of the increased scarcity. In the case of rare-earth elements, the higher prices encouraged producers to: a) find more of the existing materials and b) find alternative materials, and encouraged consumers to: a) find alternatives and b) "engineer the stuff out" of production. Among the first things I learned in Econ 101 was that unless a firm can control the necessary raw materials, patents or trade advantage, entry to the market could not be controlled. I suppose the communists haven't been at "capitalism" long enough to know that. Ok, induction motors replace brushless magnetic motors because magnets are getting too expensive. What is an induction motor? The induction motor was invented by Nikola Tesla in the 1800s. An explanation of induction motors vs. brushless magnetic motors, is provided at the electric sports car maker Telsa Motors. A lesson that the peak oil enthusiasts have not learned. BTW, Peak Goo = Peak Brains. Good point Cruiser. It is good to see that China is getting an education on how the market works. I suspect they will do less and less of this kind of silliness as time goes on. Buddy, we are still catching up to Nikola Tesla! Chart of the Day: Canadian Home Prices vs. U.S.A.
Chicago Fed Manufacturing Index Improves in Aug.